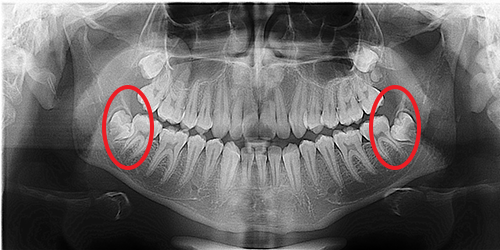 When I was a kid, I thought wisdom teeth sounded pretty cool. I figured once you got those to grow in you were now wise. As a dentist, I can tell you they are anything but wise, and I recommend to the vast majority of my patients that they should remove them. A lot of people have questions about wisdom teeth, and the most frequent is, “Why should I get my wisdom teeth removed if they are not bothering me now.” In this blog post, I’ll be answering that question and others with these top 5 reasons why you should just get those foolish teeth removed. Wisdom teeth are located in the back of your jaw and are often very close together. Because of this, flossing and brushing those teeth often gets overlooked, or simply missed, resulting in increased cavities. As we know, cavities lead to tooth decay, which can lead to more painful problems for you and your teeth. Our gums don’t generally like wisdom teeth. Because of the limited space and often odd ways wisdom teeth grow into our mouths, it makes it easier for bacteria to stay around the tooth and gums. The gums easily become inflamed, red, and can even have pus or infection around them, all of which can be quite painful. What’s worse is that this gum inflammation can spread rapidly causing inflammation across large parts of your mouth and becoming increasingly more difficult to treat. If it was not enough that your gums were inflamed, they are now more susceptible to infection. As you can see, this is quite a snowball effect. It’s not just your gums that get bothered by those pesky wisdom teeth, it’s also your other teeth! Wisdom teeth are quite rude; they do not understand personal space. Your other teeth generally have the space they need until your wisdom teeth crowd behind them. This can cause problems for your second molars and even your other teeth. Sometimes it damages the adjacent tooth making it necessary to get a filling. In other cases damage leads to a root canal. I’ve even had patients where the damage was severe enough to need both the wisdom tooth removed and the adjacent molar. Some people have small mouths or lots of crowding. That small space doesn’t allow a tooth to come out, and that pressure can be painful. We have another snowball effect: when your teeth are constantly being pushed, this can damage the enamel and bone creating tooth decay and cavities. Wisdom teeth are not consistent from patient to patient, but we have seen that they tend not to want to cooperate with the rest of the mouth. It’s common for wisdom teeth that are not removed to develop a cyst or tumor around them. These can be painful and not pleasant to treat. In some cases they aren’t problematic, but in other cases they can develop into something significant. Many people think wisdom teeth are something that is only a problem for teenagers. They either grow in the wrong way or start irritating from the start. That’s not necessarily the case. Wisdom teeth can grow into your mouth without irritating first, but over time develop problems. As time goes on wisdom teeth further develop their roots and the bones in your mouth become harder. This makes extraction more difficult and recovery longer. When you’re young it’s easier to recover and can be simpler to remove the wisdom teeth. 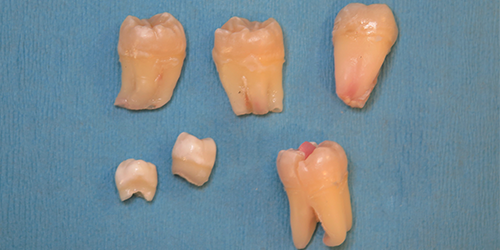 Are You Considering Wisdom Tooth Extraction / Removal? If you are considering wisdom tooth extraction/removal, then give us a call. We will happily take a look at your wisdom teeth with our 3D x-ray system so that we can see exactly what is going on in your mouth. We can make very informed decisions because of the technology and expertise we have here at Apple Tree Dental. Mention this blog article, and you’ll receive a complimentary consultation!